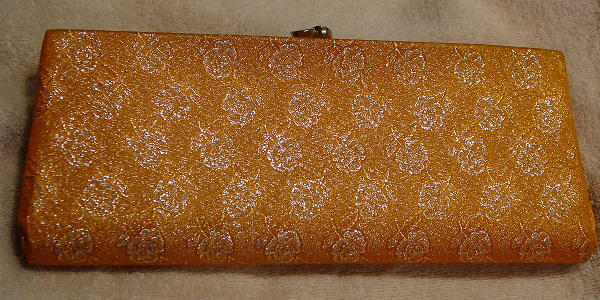 This vintage clutch has an orange fabric base with a floral design in silver metallic thread. It has a somewhat tarnished gold-tone rim and bypass closure. The center is bowed out a bit, but it still shuts tightly. The black fabric lining has a tone-on-tone diamond pattern with an open upper gold-tone trim pocket. On the pocket in gold-tone is a P, a tree, a B, and below the tree USA. She wore it to the Cannes Film Festival.